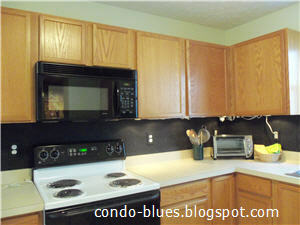 Condo Blues: Should I Repaint My Kitchen? Should I Repaint My Kitchen? Husband and I like to paint rooms with deep and saturated colors. I think it comes from renting white walled apartments for so long. I did something a little different when I painted the kitchen walls. I went with a muted green/white wall color because my overall plan is to paint the kitchen cabinets a bright cheery red instead of replacing them. I want to play with deep and light color tones in this room. I’m not sure but I think I went too light on the wall color in this room. Husband is taking advantage of this and pushing for an orange room. Especially after I took the personality and color quiz on My Colortopia. Based on my answers, My Colortopia gave us an orange paint color scheme we both like. I embedded the My Colortopia quiz widget in this post if you want to give it whirl too. It's kinda fun to play around with different answers to see what paint colors My Colortopia chooses for you. Husband wanted to go for it until I pointed out that the color of our current curtains, kitchen chairs, and linens wouldn’t go with the proposed orange walls. We’d have to replace all of that stuff too. Given the drama we had when we transported the dining room chairs home from the store and that the only set of curtains we both liked after searching for months was on vacation in Maryland, it’s best for our marriage if we keep those things in the room for now. If Husband wants a new wall color it should be something that goes with what we already have. 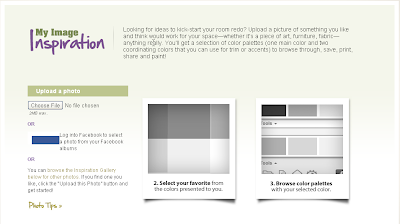 That’s where I’m stuck on color schemes. The paint flyers with the color suggestions at the store aren’t much help because they don’t have the colors of my current room elements or design inspirations. The nerve! My Colortopia has a My Image Inspiration tool. I wonder if that can help me? Instead of using My Colortopia’s preloaded inspiration photos, I took a photo of the permanent color elements I want to keep in the kitchen. 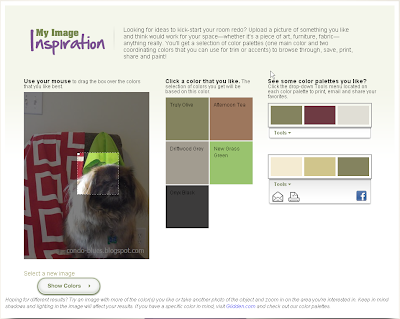 I uploaded it to the My Colortopia My Image Inspiration tool, selected the area of the photo I want to use, and clicked Show Colors. Blitzkrieg’s fur represents the tans and browns in my floor covering. Also, he sheds like a boss so anything that makes his dog fur tumble weeds look like design elements is a plus. I played around with selecting different areas and sizes of my photo to see the different colors of Glidden paint My Colortopia suggested from my inspiration photo. 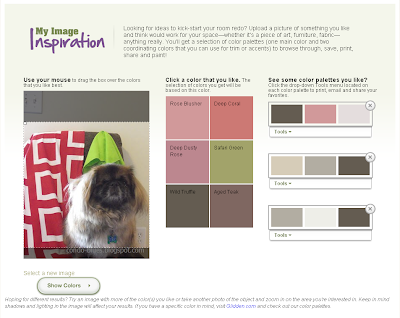 The My Image Inspiration color palette option works the same way as on the My Colortopia quiz results. I clicked Wild Truffle and it gave me three different color schemes. I moved my mouse over the color block to reveal the names of the paint colors. I like the gray (Wood Smoke) for my walls. I considered gray the first time but wasn’t sure how well it would work with the tan elements of the room. Looks like it will work just fine. Since I have to get spousal approval on this, I clicked My Tools and used the options to email the color options to Husband because we we’re out of color printer ink otherwise I’d print out the shopping list and stick it under his nose. What do you think? Should I repaint the walls of my kitchen now or wait until I eventually paint the cabinets red? 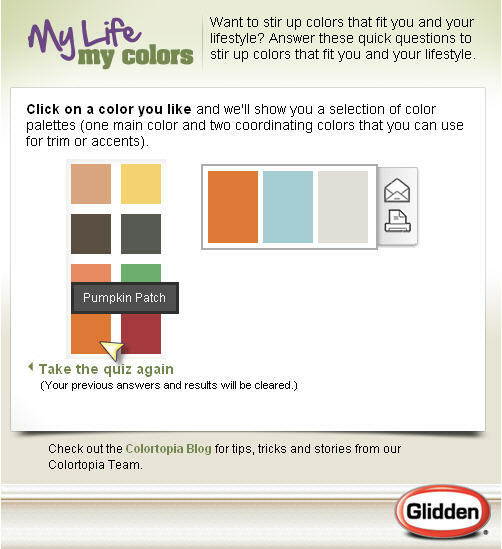 Disclosure: I have partnered with Glidden/Akzo Nobel Paints to write this post but the thoughts and opinions expressed are my own. I think that you should go with a non-green wall if you really want red cupboards. In fact, I think you should paint either the cupboards or the walls red and the remaining items, white. No matter what you do, the light green is not good. As much as I like green, it's a less appetizing color than red, orange, or yellow. Del Mar Ceiling Fan Giveaway!